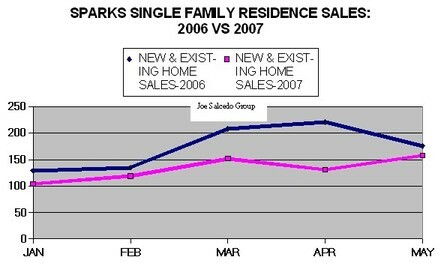 Highlights: Between Jan-May 2006 and Jan-May of 2007, the Sparks Single family residence sales was down on average -21.82% (add the 5 months together and divided it by 5) while Reno fell by an average of -26.48% in the same time period. All this time I thought Reno was holding up better than Sparks. I am wrong- if I was to base it on this data. The Sparks market compared to the Reno market has significantly lower inventory of homes. Sorry but i hate reading/interpreting graphs. After posting these graphs, can i expect for some explanations or simple discussions regarding what the graph is trying to tell us? Chesty, Good suggestion. I will be doing that in my next posts that contains graphs. I am continually looking for ways to better explain complicated/technical terms so that people can better profit from the lessons presented by the graphs/figures. Any suggestions? This page contains a single entry by Reno Home Blog Team published on August 20, 2007 1:37 PM. Before You Read The Blog was the previous entry in this blog. Introduction to the "Reno-Sparks Back to the future" 8-part series is the next entry in this blog.